The most primal weapon in football is the ability to run the ball. NFL passing attacks are damn close to rocket science, but running the ball — or stopping the run — can be understood by humanity's hairy ancestors. Hit. Wham. Clobber. Get up and do it again. Trickery in the run game amounts to little more than "Look over here, then go over there." In the absence of Sam Bradford and the technical ability he brings in the passing game, the Rams have gone medieval on offense, and it's worked. Zac Stacy carried the ball for 27 of the Rams' 31 called run plays, and totaled 127 yards with two touchdowns, and set up a third with the team's longest run play of the year. Unfortunately, Jeff Fisher's former team knows the caveman playbook as well, and they were just a little bit better at it. Chris Johnson had a resurgent day with 150 yards — 98 of which came in the second half — and two touchdowns of his own. Unlike Stacy, Johnson had help from his teammates, as Shonn Greene and Jake Locker each had touchdown runs of their own. "Live by the sword die by the sword," you could say, although "sword" implies a weapon of skill and forgery. The Rams and Titans budgeoned each other with the football equivalent of stone axes matted with blood, bone and hair. When the game was over, the Rams were the losers, thanks to their inability to stop the run, and unwillingness to keep running the ball when it was needed most. This was a one-possession game all game long, and in that kind of game one can't help but think about key mistakes. – Benny Cunningham inexplicably losing the ball after bursting through the hole and seeing nothing but daylight between him and the end zone in the first quarter. 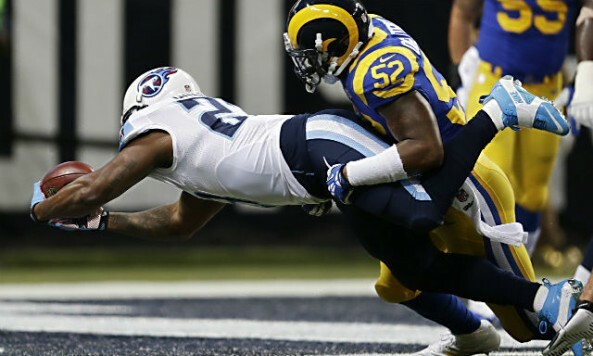 – The Rams squandering Cortland Finnegan's first impact play of the season by failing to run the ball even once deep in Tennessee territory, even to set up Greg Zuerlein on his favored left hashmark, and watching helplessly as he sailed a 44-yard field goal wide right. – Kellen Clemens failing to protect the football on a busted play, and creating a critical turnover that led immediately to Tennessee's game-winning points. – Failing to pick up a crucial first down with seconds draining from the clock, as Clemens looked to Austin Pettis and/or the referees to bail him out in the end zone. The last sequence sent Rams fans home in a familiarly piqued state. Just a week ago, Brian Schottenheimer lost track of his running plays in a crucial goal line series. Today, Schottenheimer again asked too much from his backup quarterback in a do-or-die moment in the game, as Clemens targeted Austin Pettis in each corner of the end zone on 3rd- and 4th-down from the Tennessee 26 yard line, with only four yards to gain for a fresh set of downs. These bone-headed decisions are undercutting positive game-planning, as the Rams have mounted ten drives into scoring territory in the past two games, both against quality defenses. Schottenheimer has necessarily mixed the run and the pass to get to this point. But when your best tools are stone axes, he would do well to lean on his cavemen and just keep swinging.